last thursday, i finally got to taste one of the most unique cakes i have heard of. since junjun was in the gilmore area, i asked him to buy cake slices from lia’s cakes in season. this store is known for their avocado cake. 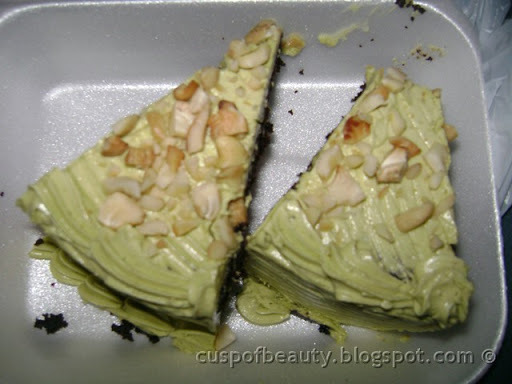 unfortunately, that was not available when he went there, so he opted for avocado choco cake instead. 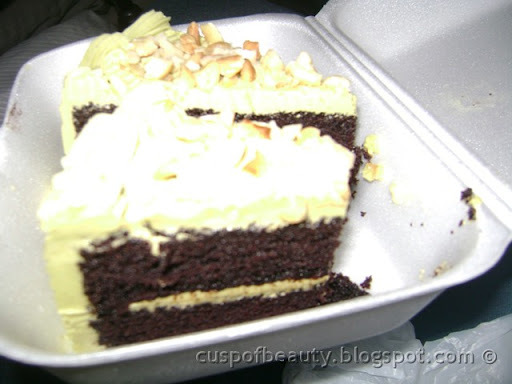 together with starbucks coffee (which we got with a discount of Php 40.00 due to earth day), we sampled the cake. it was a unique blend of the nutty and distinct flavor of avocado and the sweetness of chocolate. it was accentuated with cashew nuts. i really enjoyed each bite of the cake, which was very moist. for around Php 70.00 per slice, the cake was a treat.